"The palate of colors just takes your breath away," says Lorenz "I love taking photos from the balloon especially when we fly over Island Lake State Park, it's fabulous, it's ten times better than driving. People just have no idea how pretty it is until they get above it." Most hot air balloon rides in Michigan last about one hour and Lorenz flies over the woods and streams of Kensington Park and Island Lake State Park. He and several other pilot friends meet at Park 'n Ride area off Milford Road and I-96 (exit # 155) about 2 1/2 hours before sunset. From there he'll launch helium balloons, determine the wind direction, then take a short drive to one of nine launch sites in the area that give the best views and best landing sites downwind. What to wear? Lorenz suggests passengers wear tennis shoes and jeans. He says the air temp "upstairs" is within a couple degrees of ground temp so it's not a factor. Cameras and video cameras are highly recommended to preserve the once in a lifetime moments while flying over the countryside. Westwind Balloon Company- Plymouth, MI, Flying over Kensington Park, Brighton, South Lyon and Milford. 734-667-2098 http://www.westwindcos.com/balloon Scott Lorenz, Pilot and Owner. Scott Lorenz, a commercial balloon pilot since 1982, has logged 1,850 + hours in-flight. Media Contact: Scott Lorenz, Westwind Co. 734-667-2090. 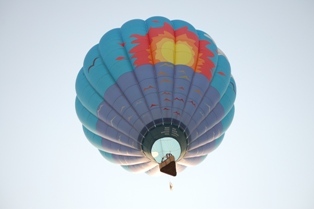 Get E-mail Alerts When Scott Lorenz - Balloonist - Hot Air Balloon Ride Michigan Sends news releases.